All NEW! Come on in and enjoy a nice coffee and a pastry while playing your favorite board game! Headshots Bar & Grill has a growing library of the latest console games, board games, & PC games. Over 500 Board games including favorites like Card Against Humanity, Exploding Kittens, Settles of Catan & more in the NEW Table Top Java Shop! Headshots Bar & Grill proudly serves Pepsi products, Energy Drinks, Specialty and Traditional Cocktails, and over fifty Beer options. 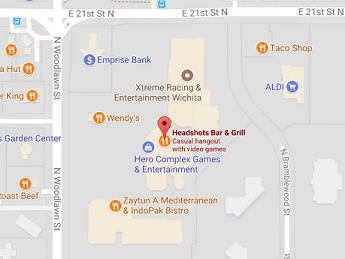 We are Kansas' Favorite Video Game Bar! American Pub Food, Craft Beer, & Video Games.